Some people decorate their home with a few Christmas lights for the season. Then there is Marty Pasieka. Pasieka's front yard in Flower Mound has a 22-foot tall Christmas tree made of more than 4,000 lights. It stands next to 10 smaller Christmas trees that glow red, green and white. And he's just getting started with the Christmas spirit. Pasieka has synchronized the lights to blink to the beat of five different Christmas songs. Passers-by can hear the music if they pull up a few yards from the house and tune in to the radio station he's programmed the music to play through. "This is just my second year doing this so, definitely, the palette is -- there's a lot more on there," he said. "Half empty or half full, definitely there is a lot more that I can do." Pasieka said he has plans to expand the Christmas display from the current 10,000 lights. "I have a few ideas," he said. But he doesn't want to give too many of his secrets away, so Pasieka is keeping his plans quiet. Meanwhile, his neighbors can't stop gushing about the display. "My wife and I always pull up and stop," one man yelled out his window, before driving off. Pasieka said it took him a few months to build the frame to hold the lights, and it takes a few days to program the lights to blink to the beat of the music. The computer work takes more time, he said. "That takes a lot more time," he said. "You have to separate it by seconds, hundredths of a second, tenth of a second, to kind of look at it and, you know, see what you like, see what it looks like." Pasieka also put on a light show for Halloween, with one sequence set to "Gangnam Style." Pasieka jokes that decorating his lawn is just a hobby. His real job? A baggage handler for Southwest Airlines. 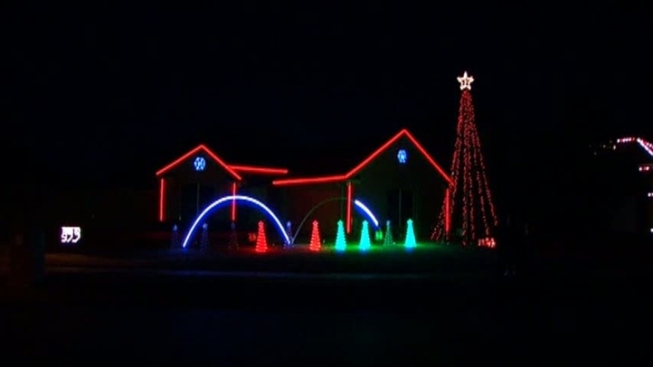 If you want to swing by and see the display, the family lives in the 4900 block of Marcus Drive in Flower Mound. The lights are on Sunday through Thursday from 6:30 p.m. to 10 p.m. On Friday and Saturday, the lights are on from 6:30 p.m. to 11 p.m.